Alappuzha Beach was formally called as Alleppey beach. If you travel to Alappuzha, you will know it is one of the most popular and clean beaches in South India, situated in the Alappuzha District of Kerala, 147 km away from Thiruvananthapuram. Alappuzha is also known as the “Venice of the East.” Traders from all over the globe used to come here in search of black gold and souvenirs. It is also one of the exotic backwater sites of South India. This Beach is also known as Alleppey Beach. On the southern side of this sandy beach, there is a park for children, called Vijaya Park. This beach has a pier on the northern side which extends into the sea. This pier is about 140 years old. From the top of the light house we can see the whole Alappuzha beach and some part of the Alappuzha Town. Boating facilities are available in the Sea view park here. Kuttanad, known as the 'Granary of Kerala', is situated here. Kuttanad is one of the few regions in the world where farming is done below sea level. It is a land of lush paddy fields and stretches for 75 kms sandwiched between the sea and the hills. Nehru Trophy Boat Race. 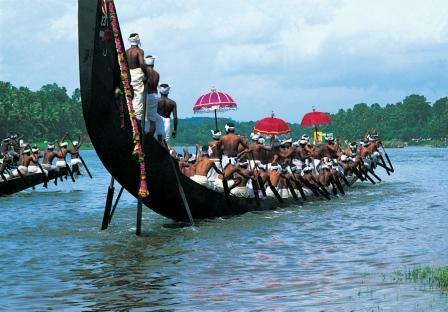 The Nehru Cup, the world famous boat race, is held at Punnamadakayal here. With the Arabian Sea on the west and a vast network of lakes, lagoons and several freshwater rivers criss-crossing it, Alappuzha is a district of unusual natural beauty. A cruise through alappuzha backwater Kerala can take you along these canals providing you the scenic beauty of the vast coconut and paddy fields and the Chinese fishing nets, which would give you a memorable vacation in the beautiful South India. Today Alappuzha is a popular backwater destination. Accommodation: Both luxury and budget accommodations are available here. By Train and By Bus Alappuzha is well connected by Rail and Road.